Highway to Swades | The depths and heights of antiquity. The depths and heights of antiquity. With a name that literally translates to “Old Fort”, Junagadh is an ancient, fortified city at the base of Mt. Girnar. This holy hill offers a 9999-step pilgrimage, climbing which is akin to striving towards the heavens. Interestingly, at its base in the heart of the city, are ancient spiraling stepwells that were hewn out of solid rock. These lead one 170 feet into the depths of the earth to find water at the bottom. 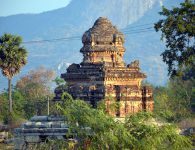 Junagadh is a city of temples and ashrams, most which are concentrated on the Taleti road which has acquired the status of being a pilgrim route. The city also has 2300 years of history and scenic beauty to boast of. Junagadh is a paradise for vegetarians. Restaurants here mostly serve authentic Gujarati cuisine which is predominantly vegetarian. The religions represented in Junagadh include Hindus, Muslims, Jains, Christians, Buddhists. A small community of African origins known as siddis also reside in and around Gir Sanctuary. « Previous PostDay 39: Porbandar to Vadodara Next Post »The temples of resilience.